Nat Fein (1914 - 2000) was a Press Photographer for the New York Herald Tribune for 33 years. He’s well known for his ability to capture the true picture of bygone years of New York City. His remarkable journalistic photography collection spans from the early 1930s to the mid 1960s. In 1948 he was assigned to cover Yankee Stadium. 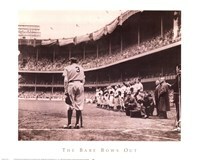 That was when Babe Ruth stood at home plate for the last time to bid farewell to his fans. Fein managed to catch the rear-angled composition that captured Ruth’s effectively with his wasted body and spindle legs, pent with pain. Fein used natural light on that day, which was essential for his softer composition and his ability to capture the surrounding scene with clarity. This photograph made him the winner of the Pulitzer Prize in 1949 and carried the distinction of having taken the most illustrious photograph in the history of sports titled "The Babe Bows Out." He began at the Tribune in 1932 as a copyboy. Three years later, Fein bought a Speed Graphic camera invested at $95.00 and he quickly turned himself into a competent press photographer with a flair for staging shots. He used to carry props in the trunk of his car, and his streak of courage sent him to dangerous, high places to capture unusual shots, like the ones he took on top of the Verrazano Bridge while it was still under construction. His peak was in New York in the post World War II decades. His success was as a result of his ability to capture the spirit of an era, an era in which true American heroes captured the imagination of the old and the young alike; an era that saw great changes taking place, especially in New York.